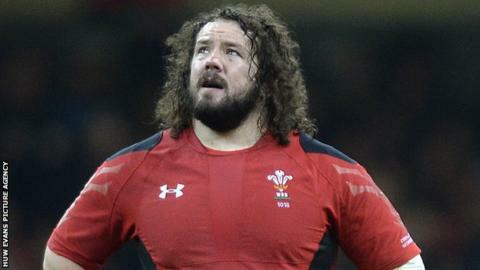 Former Wales prop Adam Jones says he does not expect a request to reconsider his international retirement from "stubborn" head coach Warren Gatland. Jones, 34, called time on his Wales career after being left out of the 2015 Six Nations squad. Wales' current first-choice tight-head Samson Lee is an injury doubt for the start of the World Cup, but Jones does not expect an offer to return. "They won't call. I think you know by now Gats is stubborn," he said. "I'm fully retired [from international rugby]. The scrum obviously didn't go well last week [in the defeat against Ireland] but I guess they're hanging their hat on Samson [Lee] being fit." After discarding the 94-cap Jones for the Six Nations, Gatland yesterday controversially dropped British and Irish Lions trio Mike Phillips, James Hook and Richard Hibbard from his 2015 World Cup training squad. After Jones retired from international duty, Gatland said he would have "preferred" the prop to delay his decision until after this year's Rugby World Cup, and had been surprised by Jones' timing. The Welsh Rugby Union said on Friday there would not be a response to Jones' latest comments from the governing body or head coach. All three of the players dropped yesterday had played alongside Jones for the Lions, Wales and Ospreys, and the Harlequins prop was surprised to see Gatland cut players with a combined 210 Wales caps. "That's why he's the head coach. He's made these decisions before, think back to the Lions," Jones told BBC Radio Wales' Jason Mohammad programme, recalling Gatland's decision to drop Ireland's Brian O'Driscoll for the decisive third Test against Australia in 2013. "He has obviously seen something in the players that he thinks will benefit them in the World Cup. "To lose that many caps is a bit of a shock." Jones believes it would be a shame if scrum-half Phillips, 32, also retired from international rugby. "If it is [his last time in a Wales shirt], it's awfully sad. Just like myself, not quite getting the milestone [100 caps] he wanted," he added. "[There are] three good scrum-halves in there, very similar all of them. "With Mike, he offers something different. He's a bigger man than them all and offers that physical presence, even if it's only the last 20 minutes."